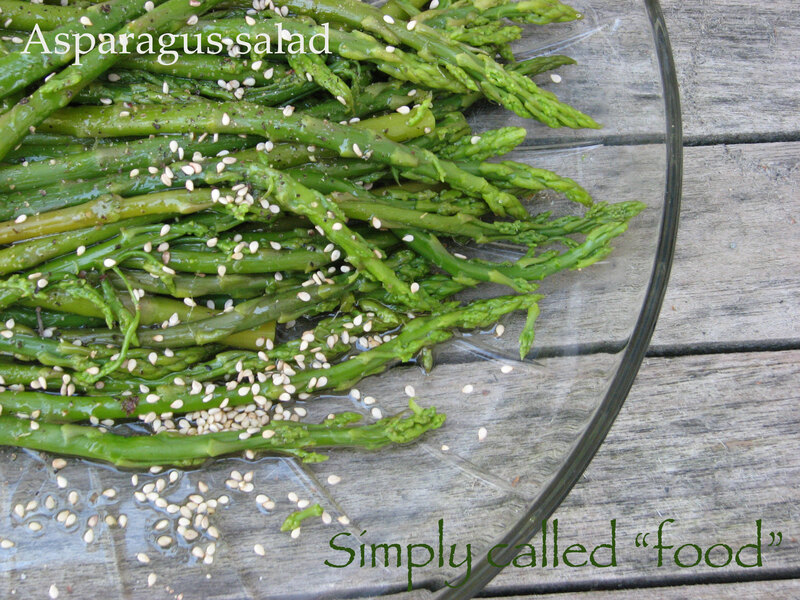 Asparagus salad | Simply called "Food"
This vegetable is one I love to eat in spring! We can get it pretty much throughout the year but very often it comes from too far. I try to have as much local food as possible so if I buy these a lot in spring. You can also get them frozen, but I find that it doesn’t give such as good result as fresh ones. This vegetable is so full of flavour, we can find it more easily after Easter. It is a good source of Vitamin B6, Calcium, Magnesium and Zinc, and a very good source of Dietary Fiber, Protein, Vitamin A (18%), Vitamin C (12%), Vitamin E (Alpha Tocopherol), Vitamin K, Thiamin, Riboflavin, Niacin, Folate, Iron (5%), Phosphorus, Potassium, Copper, Manganese and Selenium. I made it in a salad (again) I know!!! Cook the asparagus in salted water for 5 minutes according to the size of the vegetable. Drain and put in icy water to set the colour. Dry them and mix them in the oil, the vinegar, the salt and the pepper. Put the on a serving plate and cover with sesame seeds. Tags: Asparagus, Dietary Reference Intake, Fruit and Vegetable, Gluten free, Vegan, Vegetarian. Bookmark the permalink. Another great way to eat one of my favorite foods. It is such a good vegetable, it is so sweet!